Star Wars continued Atari's vector games revolution. Released to coincide with the movie release of the 3rd Star Wars film, Return Of The Jedi, Star Wars was a huge hit, thanks to its superb graphics, amazing speech samples, simple premise and awesome gameplay. 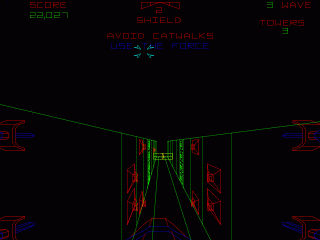 Gameplay on the arcade version of Star Wars was achieved by use of a unique yoke control, which was very sensitive and allowed extremely accurate movement. Fire buttons were located conveniently in several locations on the control, in trigger positions for your index fingers and on top for your thumbs, so you could vary your grip on the control and yet still maintain excellent movement ability. 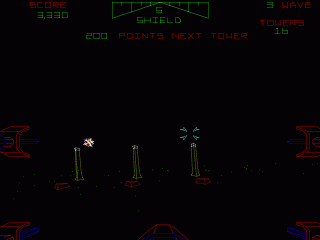 Played from a first person perspective, the game is set over three distinctly different stages which ultimately culminate in the destruction of the Death Star. Your ship is equipped with an energy shield which has a set number of charges, displayed at the top centre of the screen. Each charge can sustain one hit from an enemy shot or collision with another ship, wall or tower and the game continues until your shields reach zero and you take another hit. The first stage sees you located in outer space in a starfield, battling against Imperial spaceships and Darth Vader. You must destroy the enemy ships, attempt to disable Vader's ship and all the while avoid or shoot the enemy shots which are fired at you. Destroy enough ships and you move on to the stage 2. Stage 2 is set on the surface of the death star. You must destroy or avoid ground based firing positions and the shots fired at you, and on later levels you also have towers to negotiate your way through and shoot the tops of them. If you successfully get through this stage you move on to the 3rd and final area. The 3rd and final stage is set in the trench on the way to the reactor core of the Death Star, as in the original Star Wars Movie. You must avoid the walls, dodge or destroy the firing positions and shots fired at you and fire a killing shot into the reactor core of the Death Star to destroy it. Fail to hit the reactor core, and you are returned to the start of stage 3 with the loss of one shield. On later levels, the walls are far more tricky to get through, being placed at the sides of the trench as well as the top and bottom. 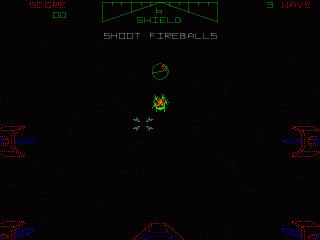 If you fire the killing shot into the core you are treated to a spectacular vector explosion as the Death Star is destroyed and you return to Stage 1 at a harder difficulty level. Extra shields are awarded at the completion of each level. Scoring: Destroy the Death Star on medium difficulty: 400,000 points bonus. Destroy the Death Star on hard difficulty: 800,000 points bonus. Destroy the Death Star: 5,000 points per shield remaining. Shooting a tower top: 200 points, increasing by 200 points per tower. Shoot all tower tops: 50,000 points bonus. Shooting a ground firing position: 200 points. Shooting a trench firing position: 100 points. Disable Vader's Ship: 2,000 points. Shooting a TIE Fighter: 1,000 points. Shooting a Fireball: 33 points. Using the "Force": bonus points for not shooting in the trench. Using the "Force" is to complete the trench stage by only firing a single shot into the reactor core and not firing any other shots. You get bonus points for this but it becomes much harder on later levels. Select the hard difficulty level as the 800,000 potential bonus points easily outweigh the difficulty.